Starrcast Update: RD Responds to Eric Bischoff - WrestleCrap - The Very Worst of Pro Wrestling! Here’s my SCATHING (and unedited!) 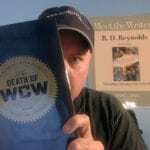 promo on Eric Bischoff defending the honor of the legendary book, The Death of WCW. He already had a response in the Starrcast Event Center, available by clicking here. See you at Starrcast, jerk! For Crappers with Archive Access ONLY - RD Rails on Eric Bischoff! 5 Responses to "Starrcast Update: RD Responds to Eric Bischoff"
It’s like the Monday Night Wars are back, but with RD in place of Mcmahon. go get em RD!!!! u the man. RD fears no savatte kicks!!!! You should’ve referred to Chicago as being WWE’s “backyard’ the way Bischoff referred to Boston as WWF’s backyard. Then it would’ve been perfect. Still, very funny! Very clever & I enjoyed it thoroughly. 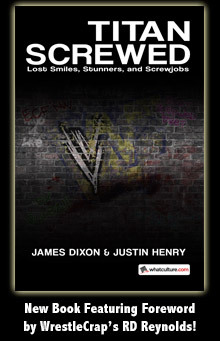 I picked up on it when I heard the term wannabes, because the word itself since that nite back in 1998 has reminded me of that DESPERATE attempt:but FAR FROM THE LAST WCW WOULD TRY to grab s BEG for some Nielsen crumbs like a dope head does for points From the Monday night wars audience. Wannabes is about a six grade cut down & I’ll never forget watching that program on the nitro replay and being blown away that just months earlier this guy was still thought of is the most powerful executive in professional wrestling And hell this wasn’t far from RAWS first win in a long time With the Vince match build in April of that year.so there were still many at the time that thought he still was the smartest man in the business. I always remember going back to 1997, why the hell was WCW still winning the ratings??? especially with the stuff going on with the Hart foundation and Steve Austin?it was such a desperate attempt by those guys at the time that it really stuck out to I believe even the Non-Internet fan as desperate. Been a fan for a long time not only do I own the book but I’ve given three buddies copies for their birthday and Christmas. Good luck and all In. You’ll need it, I listen to his podcast: there’s a very good reason why a guy with his wrestling credentials(none) got that damn job as executive producer of WCW in the first place. He is in truth an excellent worker.